Northern Territory, following a breach of approval conditions. encroached on required buffer zones which protected important rainforests and wetlands. required to undertake and pay for comprehensive remedial action. control of feral pigs and exotic grasses. for the people of the Tiwi Islands. and will ensure that jobs will stay,” said Mr Snowdon. protected under the Federal Environment Protection and Biodiversity Conservation Act 1999. The joint initiative of Sylvatech and the Tiwi Land Council was approved in August 2001. About 26 000 ha of savannah woodland on Melville Island has been cleared and planted with an Australian tropical acacia (Acacia mangium) for production of pulpwood for export. Is it right to clear native forest for industrial plantations? Not in Queensland any more or the southern states where this practice was prohibited by legislation more than 30 years ago. 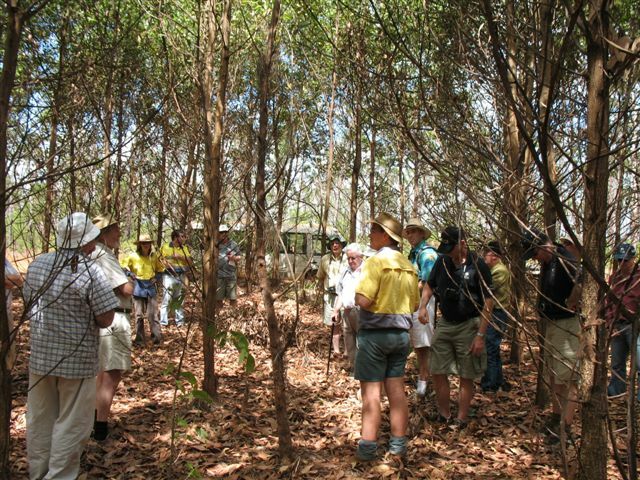 On 25 August 2008 a group of 17 members of the Institute of Foresters of Australia (IFA) were guests of Great Southern Forestry N T Pty Ltd(GSL) to see the acacia plantation project on Melville Island. We flew in planes chartered by GSL to Maxwell Creek, the GSL headquarters where there is accommodation for up to 230 workers and maintenance workshops for heavy equipment. It is like a mining camp where workers, mainly contractors, are on a fly-in-fly-out basis with 9 days work and 5 days off and a 12-hour working day. Very few of the current GSL workforce are Tiwi. After harvesting large sound eucalypt logs for export, the remaining forest is cleared with a chain between two large bulldozers, heaped, burned and ploughed. Much of the plantation has been established with genetically unimproved ‘wild’ seed from native forests in Papua New Guinea. My personal impression, as a tree breeder with 50 years experience of industrial plantations of many species in several countries, was that GSL had achieved good survival and weed control, and the trees were healthy with little damage from insects or fungi. However, the stem and branch form was not good, many trees having forks, crooked stems or coarse branches, even after ‘form pruning’ at age 1 to 2 years. Such form is common when genetically unimproved ‘wild’ seed is used in Acacia mangium plantations elsewhere. A higher pulpwood price will be needed to compensate for the reduced yield and the cost and difficulty of harvesting and debarking trees of such poor form, prior to chipping for export at age 8 to 10 years. Apart from the possible risk of low returns due to tree form, there are obvious risks from cyclone and fire. Cyclone Ingrid in 2005 caused so much damage to plantations older than three years that they were replanted. The first 26 000 ha are mainly where the old growth forest was tallest, the land well drained and not steeper than about 5 degrees. Mature height of the native forest is a good indicator of the growth rate of plantation. On sites of lower productivity there would be less prospect for profitable return on the plantation investment. There are many questions to ask about the Tiwi forestry project. The main one is ‘who gains, and who loses’? Investors in GSL’s Managed Investment Scheme have immediate gain from 100% tax deductibility on the whole of their investment of several thousand dollars per ha. A net profit at harvest would be a bonus, but subject to capital gains tax. The Tiwi clan groups who have freehold of the land receive a very small amount for leasing their land to GSL compared with GSL’s lease payments to grow blue gum in southern Western Australia. The Tiwi investment company Pirntubula receives any royalties from exported eucalypt logs and later from wood chip exports. Melville Island has a 50-year history of forestry development intended to benefit the Tiwi people. In the early years there were small sawmills sawing eucalypts and cypress. The first plantations in the 1960s were of cypress (Callitris intratropica), along with trials of many other tree species. By the 1970s the slow growth of the 1700 ha of cypress led to a change to Caribbean pine (Pinus caribaea var. hondurensis), 2200 ha, but there were marketing problems. There was considerable Commonwealth Government investment in forestry research and development between 1960 and 1978. One of the losers from the Tiwi forestry project is the native forest ecosystem, irreversibly destroyed by clearing. There is a need to consider a Comprehensive, Adequate and Representative System (CARS) as in other parts of Australia, as part of an overall forest policy for the Northern Territory. The IFA advocates that the policy should also include a Code of Practice addressing clearing of native forest and such social issues as availability of land and labour.